Apple's new iPhone 6 and iPhone 6 Plus (Specs and Price) - Balita Boss! Apple on Tuesday, September 10 announced its newest iPhone during launch event in Cupertino, California.The company launch not one but two models of iPhone 6, the iPhone 6 and iPhone 6 Plus. The iPhone's screen has grown once again. The iPhone 6 will offer a 4.7-inch screen while the iPhone 6 Plus will boast a 5.5-inch screen. The iPhone 6 Plus screen resolution will feature a full Retina HD resolution of 1,920 x 1,080 with a pixel density of 401 ppi (pixels per inch), while the iPhone 6 has a slightly lower 1,334 x 750 resolution with 326 ppi. The iPhone 6 will scale down to only 6.9mm thin, making it the slimmest handset Apple has ever made, while the iPhone 6 Plus is 7.1 mm thin. 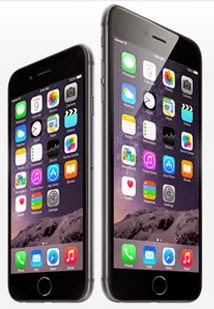 The slightly heftier iPhone 6 Plus weighs in at 172 grams while the iPhone 6 is 129 grams. Both models feature an upgraded 8 megapixel rear-facing iSight camera sporting a f/2.2 aperture and 1.2 MP FaceTime Camera. The iPhone 6 Plus has the extra advantage of optical image stabilization, a significant improvement over the iPhone 6's digital image stabilization. The camera's new sensor allows for auto-focus that works twice as fast, improve skin tones, recognize faces faster and take better macro photos, thanks to "phase detection focus." The new phones can now shoot shoot 1080p video at 30 frames-per-second or 60 frames-per-second, and capture slo-mo video at 120 frames-per-second or 240 frames-per-second. There’s also a time lapse feature and new continuous autofoucs for video. The new iPhones offered substantially improved battery life with built-in rechargeable lithium-ion battery. Apple says the iPhone 6 battery life will have up to 10 hours on 3G, up to 10 hours on LTE, up to 11 hours on Wi‑Fi. The larger 6 Plus promises 16 days of standby time, and up to 12 hours on 3G, up to 12 hours on LTE, up to 12 hours on Wi‑Fi. The iPhone 6 and 6 Plus both have M8 motion coprocessor and the new Apple A8 chip with 64-bit architecture. This 64-bit chipset is has 2 billion transistors inside. Apple says this all adds up to 25 percent faster CPU performance and up to 50% faster graphics performance when compared with the 5s. The A8 is also promised to be 50 percent more energy efficient than the A7 chips in the iPhone 5. Both the iPhone 6 and 6 Plus have 802.11 ac Wi-Fi connections in the devices, which Apple says is three times faster than 802.11 n. Both also support LTE bands. iPhone 6: $199 for 16 GB, $299 for 64 GB and $399 for new 128 GB (with 2-year carrier contract). iPhone 6 Plus: $299 for 16 GB, $399 for 64 GB, $499 for 128 GB (with 2-year contract). You can pre-order the iPhone 6 through Apple.com and it will ship to your home for free on Sept. 19. Apple will start taking pre-orders on Sept. 12.